Average Height	: 15" - 18"
Average Weight	: 25 - 45 lbs. Photo Courtesy of : American Water Spaniel Rescue, Inc.
American Water Spaniel Rescue, Inc. There is little actual information on the development of the American Water Spaniel, although it has been a recognized breed by the American Kennel Club since 1940 and many other kennel clubs also recognize the breed. There are also many areas of the United States that claim the development of the breed, although it is most closely identified with the Midwest area of the US and is the state dog of Wisconsin. The breed was developed exclusively as a hunting dog and excels at both flushing birds as well as retrieval on both land and in the water. Many dog lovers believe it is a variety of Irish Water Spaniel whereas others believe it is a crossing of several breeds including the Tweed Spaniel, Curly coated retriever breeds and the English Water Spaniel may all have contributed to the genetic make-up of today's American Water Spaniel. The American Water Spaniel remains an excellent hunting dog today, although it is not as popular as many of the other hunting breeds. It is not typically seen at shows although it is often seen in championship hunting trials. As a sporting type of dog there is no need for registry to compete, so while the official AKC numbers are relatively low for this breed it is estimated that there are many more American Water Spaniels that are actually recorded. THE AMERICAN WATER SPANIEL WAS THE FIRST BREED DEVELOPED IN THE USA AS AN ALL-AROUND HUNTER THAT COULD RETRIEVE FROM BOATS. The American Water Spaniel is a very energetic and intelligent dog that has been used for hunting and retrieving throughout the midwestern areas of the United States. It is an excellent swimmer that loves being in the water, even in rough water conditions or in colder temperatures. The American Water Spaniel is a very gentle, kind and affectionate dog as well as an energetic hunting dog and an incredibly intelligent worker. They are typically very good with children and other pets in the family, although they are known to be dog aggressive with strange dogs. 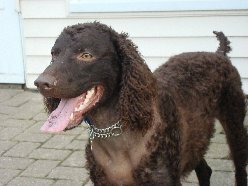 The American Water Spaniel can be socialized while they are young and this will help prevent any aggression in both males and females. Intact males are most prone to being aggressive towards other dogs, especially in the presence of females in heat. The American Water Spaniel is a good companion dog and is well behaved in the house provided they have been properly trained. While not prone to chewing, they are known to be a barking breed and a good watchdog, although they are not typically good guard dogs due to their small size and spaniel temperament. Occasionally an American Water Spaniel can be timid, especially females. Socialization from an early age will help this behavior as well as the aggression in males. The American Water Spaniel can be a drooling breed, especially after eating or drinking. The American Water Spaniel is an excellent all round companion dog and loves to be around people. Despite their independent nature while hunting they do make ideal obedience dogs and are also fun loving and enjoy a good romp and run with the kids. The American Water Spaniel is usually good with children and is sturdy enough to handle a fair amount of rough play. They are great fetchers and will happily play for hours chasing a ball or stick. A roaming breed the American Water Spaniel will need a fenced yard or to be kept on a lead until well trained to return when called. They can become focused on a scent or trail and will often track almost absentmindedly, roaming much farther than they intended. These dogs make excellent pets for moderate to extremely active families. Generally the American Water Spaniel is a very healthy breed and is only occasionally bothered by hip and eye conditions. As with all breeds the American Water Spaniel will need regular vaccinations, worming and flea and tick treatment. For American Water Spaniels used in field events or hunting it is very important to check for ticks after every outing to prevent any possible diseases or infections that can be caused by contact with the ticks. The American Water Spaniel is a great breed for those dog owners that don't want to spend a great deal of time in grooming routines. The American Water Spaniel has a very oily feeling coat that may occasionally be somewhat "doggy" smelling. While the first instinct may be to bath the dog, this should only be a last resort. Over bathing or frequent bathing will strip the oils from the coat and may cause severe skin irritations and possible allergy type reactions. If you do need to bath the dog only use very gentle special dog shampoos and conditioners and be sure to rinse very thoroughly to remove any soap or product residue. The ears should be carefully checked for any signs of discharge or infection. Usually this is first noted by a foul waxy smell coming from the ear. Carefully drying out the ear and wiping with an ear solution available from the vet will help eliminate waxy buildup. In addition you may wish to pluck the hairs from the outer ear to help the ear stay clean naturally. The American Water Spaniel does best with lots of regular exercise. They are not terribly choosy about what they are doing, as long as they are doing something fun, interesting and with the family. The American Water Spaniel is happy to go for a long walk through the neighborhood or go to the park in the off leash area and just get a chance to run. They are excellent retrievers and will spend as much time chasing the ball, toy or Frisbee as the owner will spend throwing it. It is important to never have the American Water Spaniel jump into the air to catch the ball or Frisbee, this can lead to problems with the joints as the dog matures. A true water loving dog the American Water Spaniel will usually jump immediately into any water he or she can find. Their coat is very water repellent and usually a quick shake a few minutes in the sun will have them dry enough to jump back into the car without a mess. Since they are such avid swimmers and this is an excellent form of exercise many owners combine a game of fetch with a swim, really adding to the fun of the outing for the dog. It is not always possible to take the American Water Spaniel out to the lake, beach or park however. They can learn to be moderately active indoors but will still need at least one walk or time outside per day. These pets prefer some outdoor time and are very good at self-exercising when outdoors either by themselves or with a companion dog. They will naturally roam and follow scent trails on the ground so a fence is essential for the breed. A well-exercised American Water Spaniel will be calm and relaxed indoors and will find a comfortable place to rest, typically as close to the family as it can get. The American Water Spaniel just wants to make the owner happy, making them a very pleasant and easy to work with breed of dog. Even as a puppy the breed goes out of its way to understand what the owner is asking. They are considered to be a very easy dog to train although socialization is very important and can cause problems in the future if not included in the training process. The breed is easy to housetrain and is very clean, making them an ideal candidate for crate training techniques. With consistency and effort on the part of the owner this breed typically will be housetrained in two to three weeks. The American Water Spaniel will tolerate fairly repetitious types of training although like any breed they enjoy variety. Since they are a very active and energetic dog it is advised that exercise periods start the training routine and also end the training routine. This will allow the dog to always associate training with something fun. Training as hunting dogs requires additional time by the owner. Many hunters take their dogs to private trainers to help with the basics. Usually the dog is a hunter by nature, the training actually teaches the hunter and the dog how to work together while hunting. Many hunters choose to enter their American Water Spaniels in hunting trails and events, in which this breed will excel. It is very important when working with the American Water Spaniel that the handler never uses harsh punishment or a rough or mean tone of voice. These dogs can easily become cowed and nervous when negative type training methods are used. Work on the dog's strengths and use positive praise and ignoring rather than punishment based training for the best possible results.